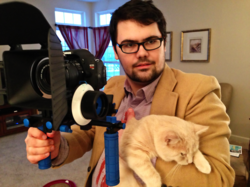 Jeff Burgess is an indie filmmaker and musician, known in the Brony community for his prolific and collaborative songwriting. In 2012 he released the first ever physical album of pony-related songs, a CD called Born to Trot. He's been working in film and music for many years, having released a number of award-winning short films and albums. Most recently, he made the first Brony horror film, called Love & Terminate. When he's not working on new films or music, Jeff likes to reflect on his deep appreciation for smooth jazz. Smooooth.